What Size Container For Peppers and Tomatoes? Pam, How many plants depends on how large the container. For an average 15-18 inch, lightweight pot I would not plant more than one plant per pot. When gardening in containers you have to remember that you are restricting the plants’ access to nutrients and moisture that are naturally occurring in the soil. If you over-plant you are putting your plants under stress because they compete with each other for very limited nutrients. It’s better to go with one plant with a slightly smaller pot and use several pots for multiple plantings. If you use square pots they will all nicely line up in a row like a garden! Because they are confined, moisture will be an issue, unless you happen to live in a location that receives daily rainfall. If not, daily watering will most likely be necessary to keep the soil evenly moist. During periods of extreme heat they may require water more often. Growing plants are thirsty plants. If you have the ability to set up a drip system for each pot and can put it on a timer, then watering very early in the morning is ideal. The confinement also limits the supply of essential nutrients to the plant, so more frequent feeding will be needed as well. Adding a slow-release fertilizer that is evenly balanced when you pot the plants is a good start. This will give plants the needed micro-nuritents not found in a sterile potting mix. 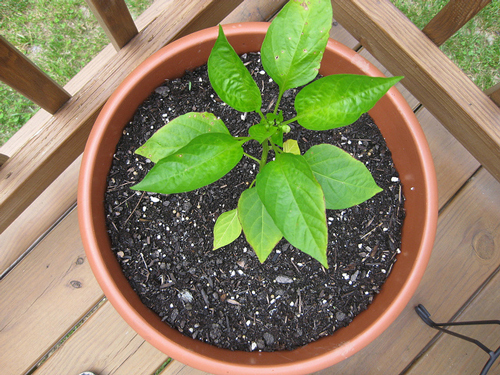 Read our blog article Container Gardening for Tomatoes and Peppers for detailed fertilizing instructions. Why Is My Asparagus Not Growing Well? Why Are My Bell Peppers Rotting?